Next Friday, July 31, we will be hosting approximately 2,000 potential new Huskies and their families on campus. 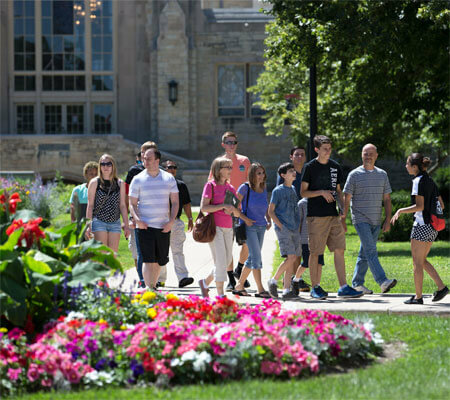 The Northern Illinois University Summer Open House takes place mainly in Holmes Student Center, but a campus scavenger hunt and departmental receptions are also planned. Open House experiences weigh very heavily on students’ final decision on where they will attend school. We have an excellent opportunity to show these students why NIU should be their home, come next fall. Volunteers are needed to assist in giving residence hall tours between the hours of 10:30 a.m. and 3 p.m. All volunteers will have the opportunity for training previous to the open house. To volunteer, please email Ted Campbell (tcampbell9@niu.edu). “Park it Forward!” Give your usual parking spot to a potential student and their family by avoiding the parking deck Friday. This is the designated parking area for our guests, giving them easy access to Holmes Student Center. Wear your name tag or “Ask Me, I can help you” button to identify yourself as a friendly university employee ready to help. Offer a friendly smile to families as you encounter them, and welcome them to campus. As always, thank you for making our community a wonderful place. Together, we can provide a friendly, welcoming environment that will show these potential new students that NIU is where they belong.